The days are getting shorter, temperatures are dropping, and Thanksgiving is on its way. Celebrate this holiday the green way by decking out your home and table with gorgeous, simple, seasonal decor you can make yourself. From table centerpieces to candles, we’ve gathered 6 Autumn-inspired projects you can craft this Thanksgiving without setting foot in a store. Want a rustic accent for your table? It’s easy to use vegetables and paint to create a fun, custom table runner from brown paper. Cut a piece of brown packing paper to fit the length of your table, adding on about two extra feet of length on each end to drape over the table ends. 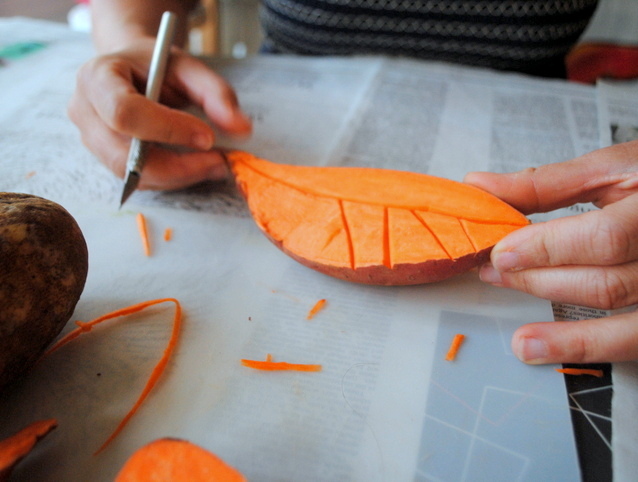 Then carve fun shapes into the vegetables, coat them in paint, and stamp away! Follow our fun DIY tutorial for more on how to create stamps with veggies here. This simple DIY centerpiece highlight is as easy as apple pie. Gather up your desired number of apples (crisp, hard apples work best) and test to make sure their bottom shape will keep them upright. Then polish them. Hold the votive candle over the top of the apple and mark on four sides with the knife to estimate how big you’ll need to cut the hole. Gently cut a votive-shaped circle in the top of the apple and remove the skin and stem. Next, carefully chip out sufficient apple flesh to make a depression deep enough to hold the votive candle. Insert the candle, light and enjoy. Want your Thanksgiving table to look extra-special this year? You don’t need to be Martha Stewart – all you’ll need are a few simple seasonal items you can pick up at the farmer’s market or gather outdoors. The key to an eye-catching Thanksgiving centerpiece is achieving a good mix of colors and textures. Start with a tablecloth or table runner in a solid color or muted print. Clear a space in the middle of the table to start creating your centerpiece. Begin with the greens, laying branches or leaves in an narrow oval shape with the leaves pointing outwards in a spray. Next add the orange fruits or vegetables. Finally, place a few brown items such as pinecones, dried seed pods, or nuts in and around the orange items. For an extra warm glow, place cylinder candles in between the fruit or even add in a pair of red apple votives (see above for instructions). For a fun and seasonal twist on traditional garlands and buntings, try making a string of these fun and colorful paper feathers. First, sketch out the shape of the feather you’d like. Then accordion-fold sheets of paper, trace the feather shape and cut them out. Once you have approximately 15-20 feathers cut out, fold them in half lengthwise (you can stack a few together to make this simpler), then snip fringes into the edges of your feathers. Unfold the feathers and place them on a sheet of newspaper. Cover each feather in a light wash of watercolor. We used very watery mixtures that would blend color easily and used at least two colors per feather. Let the feathers dry completely, then cut a length of fishing line. 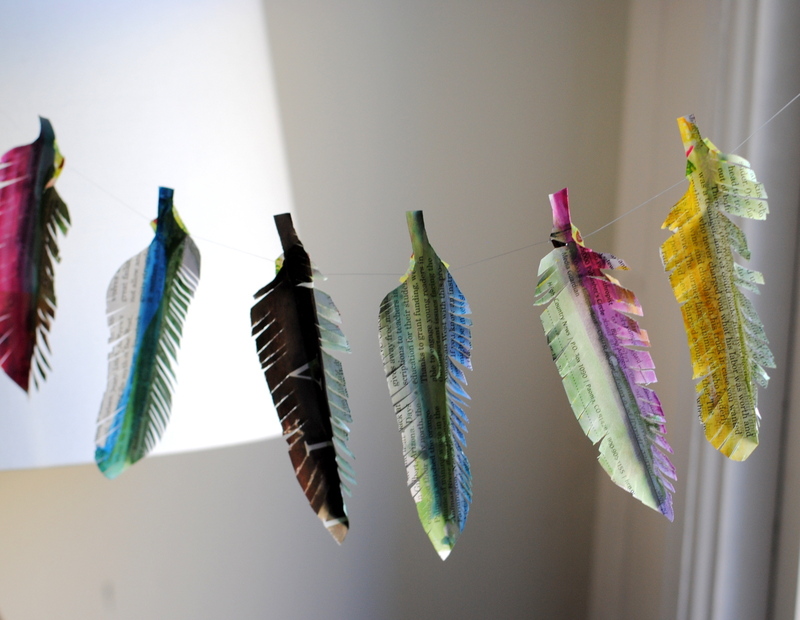 Using tiny pieces of washi tape, tape the end of each feather onto the fishing line from behind. Hang them up and admire how they flutter in the breeze. You could also glue the feathers onto place cards, or drape them around your table centerpiece. It wouldn’t be Thanksgiving without cranberry sauce, but these shiny red berries also make sweet decor. 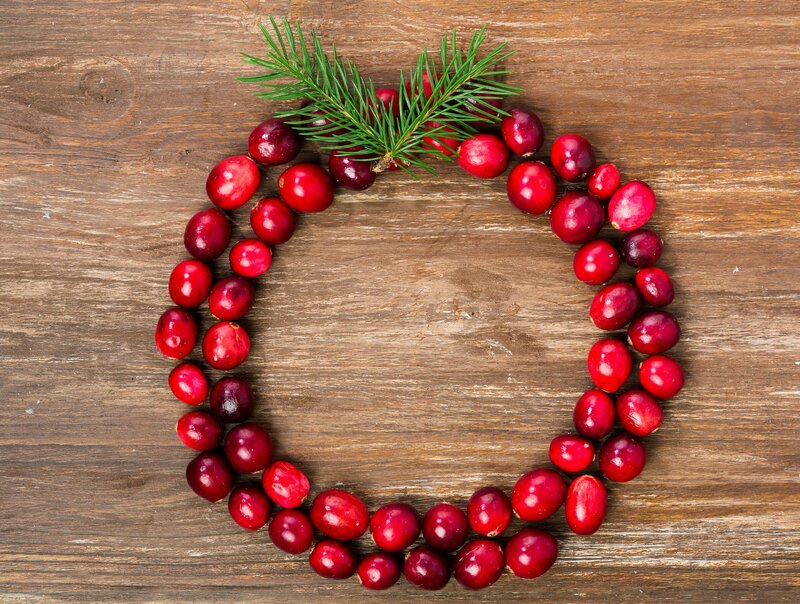 Create rings or hearts from cranberries and wire that you can use to place around candle bases, hang with ribbon, or use as place markers. Cut a length of floral wire adequate to create a ring and begin to string cranberries by pushing the wire lengthwise through each berry. Once you’ve filled the wire, join the two ends and twist together. To create a heart, simply pinch the base of the circle and push an indent opposite of it. Looking for a simple, affordable decoration that always makes a room look extra-special? Bunting does the trick — whether draped across a doorway, hung from the wall, edging a table, or festively pinned to a windowsill, the colorful fluttering flags will lend a holiday air to your decor. You can make bunting from recycled greeting cards, mail, or other recycled colorful paper to make this craft more eco-friendly. Head on over to our complete tutorial on making recycled bunting to follow the steps and create your own. The days are getting shorter, temperatures are dropping, and Thanksgiving is on its way. Celebrate this holiday the green way by decking out your home and table with gorgeous, simple, seasonal decor you can make yourself. From table centerpieces to candles, we've gathered 6 Autumn-inspired projects you can craft this Thanksgiving without setting foot in a store. Want a rustic accent for your table? Its easy to use vegetables and paint to create a fun, custom table runner from brown paper. Here's what you'll need: one roll of brown packing paper, assorted vegetables (potato, yam, apple, turnip), acrylic paint, paintbrush, and a sponge. Cut a piece of brown packing paper the length of your table, adding about two extra feet of length on each end to drape over the table ends. Then, carve fun shapes into the vegetables, coat them in paint and stamp away. Follow our fun DIY tutorial for more on how to create stamps with veggies here. This simple DIY centerpiece highlight is as easy as apple pie. 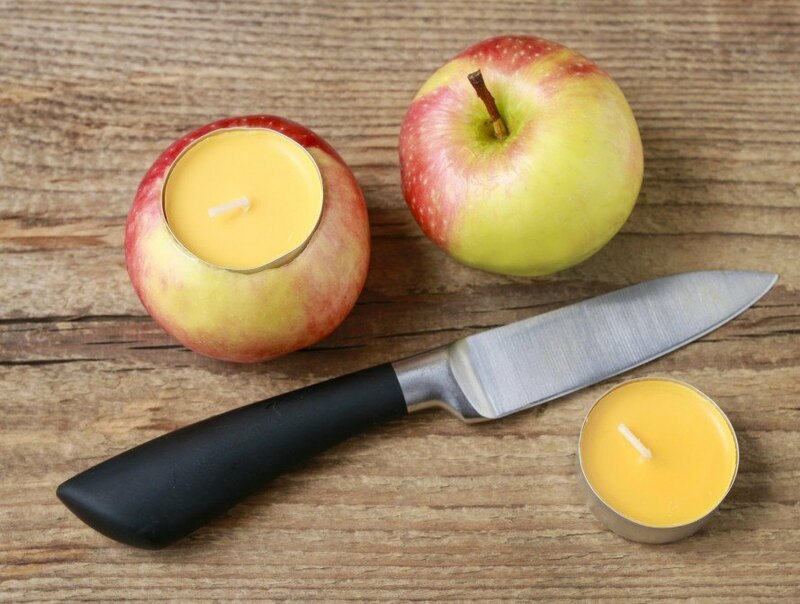 You'll need: apples, votive candles, and a knife. Gather up your desired number of apples - crisp, hard apples work best, and test to make sure their bottom shape will keep them upright - then polish them. Hold the votive candle over the top of the apple and mark on four sides with the knife to estimate how big you'll need to cut the hole. Gently cut a votive-shaped circle in the top of the apple and remove the skin and stem. Next, carefully chip out sufficient apple flesh to make a depression deep enough to hold the votive candle. Insert the candle, light, and enjoy your seasonal lights. Want your Thanksgiving table to look extra-special this year? You don't need to be Martha Stewart - all you'll need is a few simple seasonal items you can pick up at the farmer's market or gather outdoors. The key to an eye-catching Thanksgiving centerpiece is achieving a good mix of colors and textures. 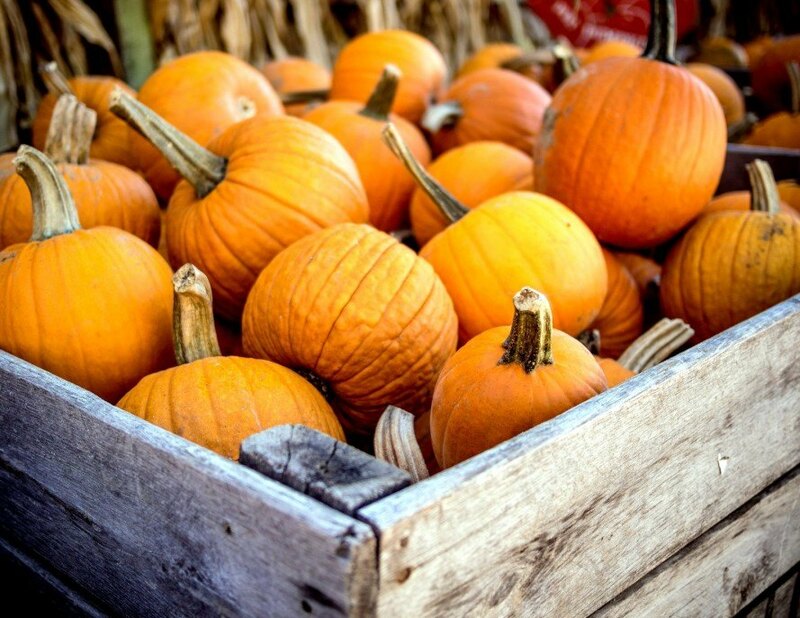 You'll need items from each of these three color groups: Oranges (pumpkins, persimmons, oranges, or gourds), Greens (bay leaves, fir or pine boughs, olive branches or rosemary) and Browns (pinecones, fall leaves, or nuts). Start with a tablecloth or table runner in a solid color or muted print. Clear a space in the middle of the table to start creating your centerpiece. Start with the greens, laying branches or leaves in a narrow oval shape, with the leaves pointing outwards in a spray. Next, add the orange fruits or vegetables. Finally, place a few brown items such as pinecones, dried seed pods, or nuts in and around the orange items. For an extra warm glow, place cylinder candles in between the fruit or even add in a pair of red apple votives (see above for instructions). For a fun and seasonal twist on traditional garlands and buntings, try making a string of these fun and colorful paper feathers. Here's what you'll need: magazines or other recycled printed paper with a white background, fishing line, washi tape, scissors, paintbrush and water, a set of watercolors or gouache paints. First, sketch out the shape of the feather you'd like. Next, accordion-fold sheets of paper, trace the feather shape, and cut them out. Once you have approximately 15-20 feathers cut out, fold them in half lengthwise (you can stack a few together to make this step simpler), then snip fringes into the edges of your feathers. Unfold the feathers and place them on a sheet of newspaper. Get your paints ready and cover each feather in a light wash of color. We used very watery mixtures that would blend color easily, and used at least two colors per feather. Let the feathers dry completely, then cut a length of fishing line. 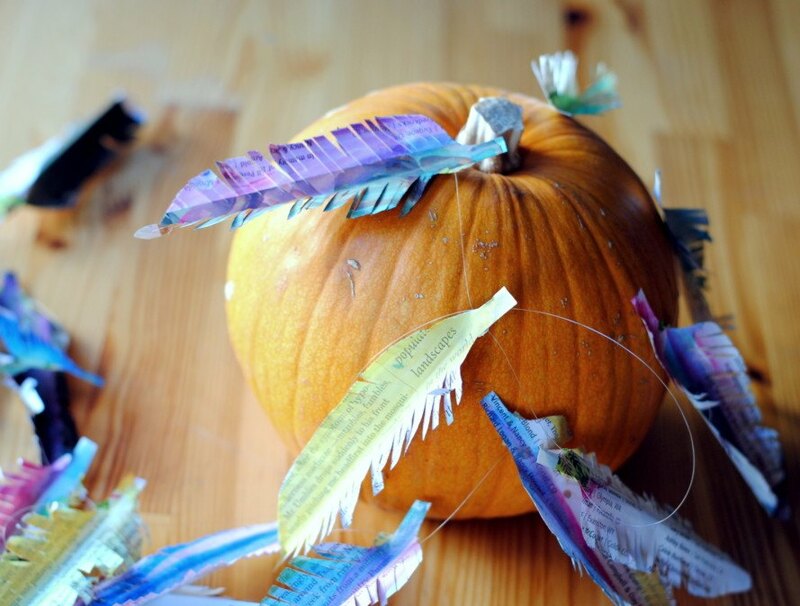 Using tiny pieces of washi tape, tape the end of each feather onto the fishing line from behind. Hang them up and admire how they flutter in the breeze! You could also glue the feathers onto place cards, or drape them around your table centerpiece. It wouldn't be Thanksgiving without cranberry sauce, but these shiny red berries also make for sweet decor. Create cute rings or hearts from cranberries and wire that you can use to place around candle bases, hang with ribbon, or use as place markers. What you'll need: one bag fresh cranberries, floral wire, snips, optional ribbon or string. Cut a length of floral wire adequate to create a ring and begin to string cranberries by pushing the wire lengthwise through each berry. Once you've filled the wire, join the two ends and twist together. To create a heart, simply pinch the base of the circle and push an indent opposite it. Looking for a simple, affordable decoration that always makes a room look extra-special? Bunting does the trick - whether draped across a doorway, hung from the wall, edging a table, or festively pinned to a windowsill, the colorful fluttering flags will lend a holiday air to your decor. You can make bunting from recycled greeting cards, mail, or other recycled colorful paper to make this craft eco-friendly, too! What you'll need: recycled cards and other colorful paper, needle and thread, glue, scissors. 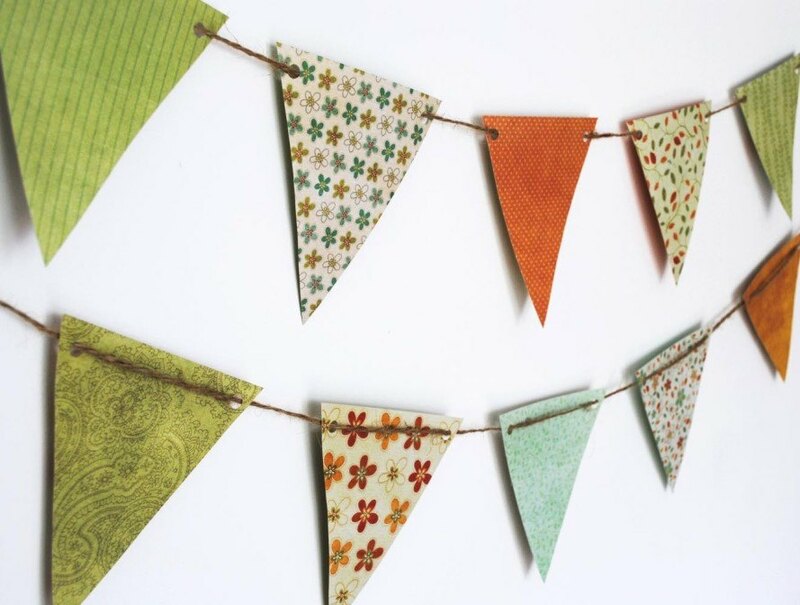 Head on over to our complete tutorial on making recycled bunting to follow the steps and create your own.